Intra-articular corticosteroid injections (IACI) are a standard treatment in juvenile idiopathic arthritis (JIA). This study assessed response to IACI in a large prospective cohort of children and young people (CYP) recruited at initiation of treatment. 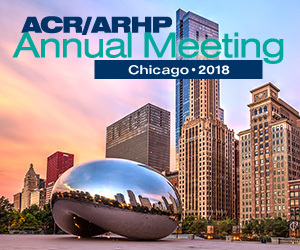 Participants were in the Childhood Arthritis Prospective Study (CAPS), an on-going prospective inception cohort study in 7 UK paediatric rheumatology centres, recruiting CYP <16 years with new inflammatory arthritis persisting for ≥ 2 weeks. Demographics, disease features, joint count, treatment details, Childhood Health Assessment Questionnaire (CHAQ), physician’s global assessment (PGA), parent’s general evaluation of well-being (PGE), ESR are collected at first presentation, 6 months, then yearly. Of 1477 CYP recruited to CAPS 759 completed 3 years follow-up and 603 (79.5%) were treated with IACIs. 185 (24.4%) required IACI alone (with a single episode of injection as the only treatment in 100, (13 % of the total cohort) usually the knee in 80 %. Most injected patients required additional treatments, 393 (69.3%) commenced a DMARD or biologic agent. 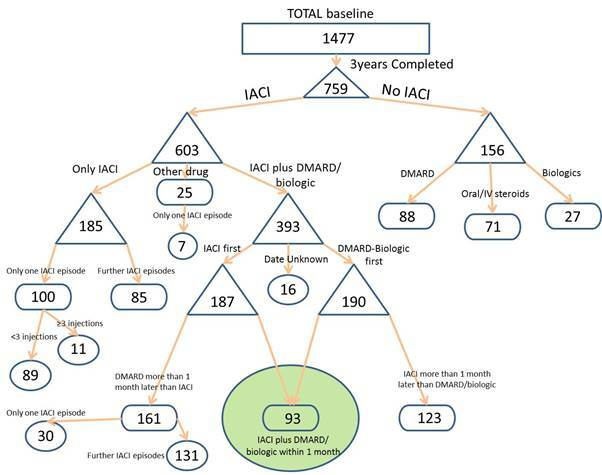 Of these, 93 patients received both DMARD/ biologic and IACI at the same time. 390 of the 759 patients completing 3 years of follow-up had oligoarticular JIA of whom 332 (85%) received steroid injections, 163 (42%) treated exclusively with IACI 85 (25%) receiving only one episode of injection. Baseline predictors of the need for DMARD in addition to IACI were a higher total active and limited joint counts, ESR, physician’s global and the CHAQ score (p<0.0001), and pain scores (p<0.003). Approximately one quarter of patients required monotherapy with IACI alone. Only 13% of all patients and 25% of oligo-articular course patients were managed with a single injection. Higher measures of disease activity were significantly associated with the need for DMARD therapy in addition to IACI.